Chips to left corners and very tiny edge chip left, light surface scratches but for the most part the glaze surface is fine, very clean and bright. 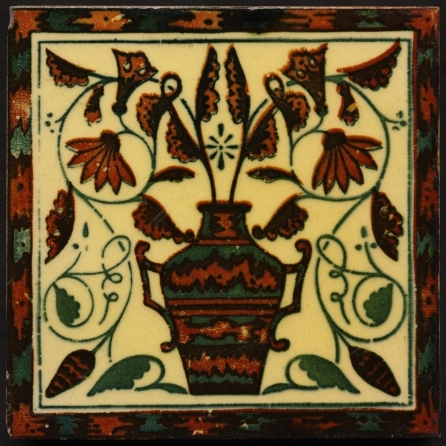 An aesthetic design of the 'flowers in vase' genre as well featured in japanese design made in this unusual technique exclusive (or almost so) to George Wooliscroft & Son and extensively used for Derwent Foundry Co tiles. The decoration apparently sprayed or sponged on to transfer paper then applied to the tile similar to transfer printing. Verso a bit grubby but with quite clear and rarely found WS monogram. The image is full size at 72 dpi (about 430 pixels wide) in maximum quality JPEG format. Customers may request a larger 120 dpi image also in maximum quality JPEG format for closer inspection which will be sent by email.